Something unexpected happened as 2018 came to an end. 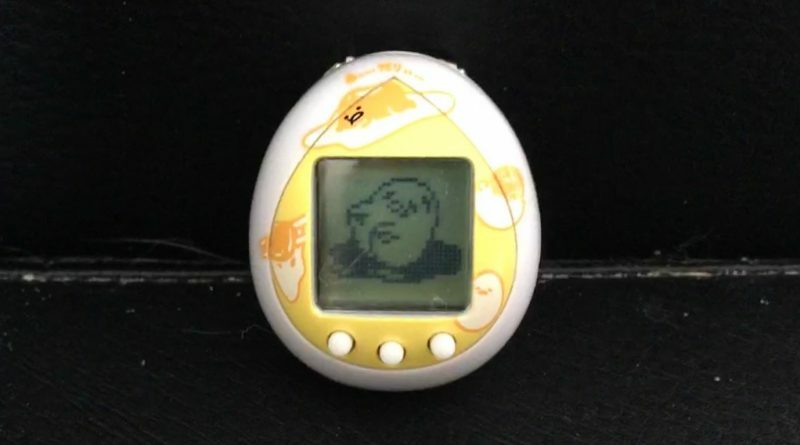 Brace yourselves, because an odd Tamagotchi was released outside of Japan. A year after its Japanese debut, the Gudetama Tamagotchi ended up getting an English release in North America. This is simultaneously odd and novel, which means we are going to look over what this strange little device is and why it is such a cool thing to have. 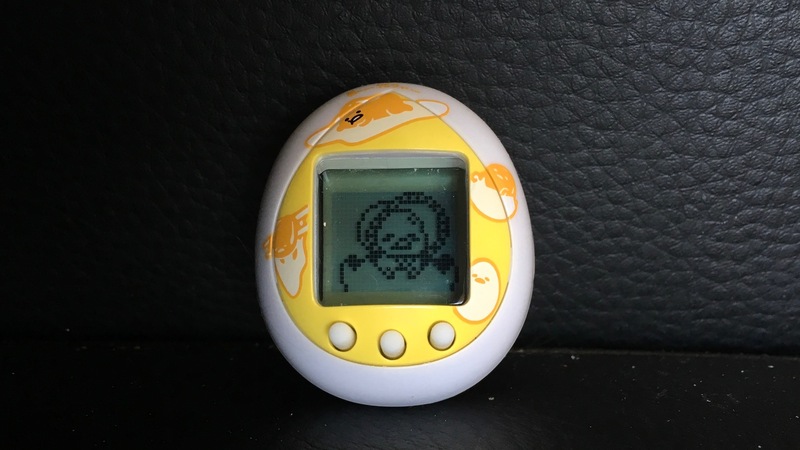 First, the Gudetama Tamagotchi belongs to a line known as a Tamagotchi Nano. This means it is a rather barebones release that has no UI or status screens and is a fraction of the size of a normal Tamagotchi. I’d say it is 30% smaller than a normal Tamagotchi and 60% smaller than a Tamagotchi ID. It is less demanding than a normal model, since it only has a 24-hour baby stage that leads into its adult stage, one minigame and doesn’t require as much constant care as a traditional Tamagotchi. Only three licensed Tamagotchi Nanos exist, and they are the Tokyo Disneyland Pocket Usatama, this Gudetama model, and the Eevee variant. The Gudetama Tamagotchi lifespan kicks things off in quite possibly the most appropriate way. Gudetama is an egg yolk. Their life begins as an egg, which swiftly cracks in half to reveal a newborn Yudetamago variant of them in a bonnet. 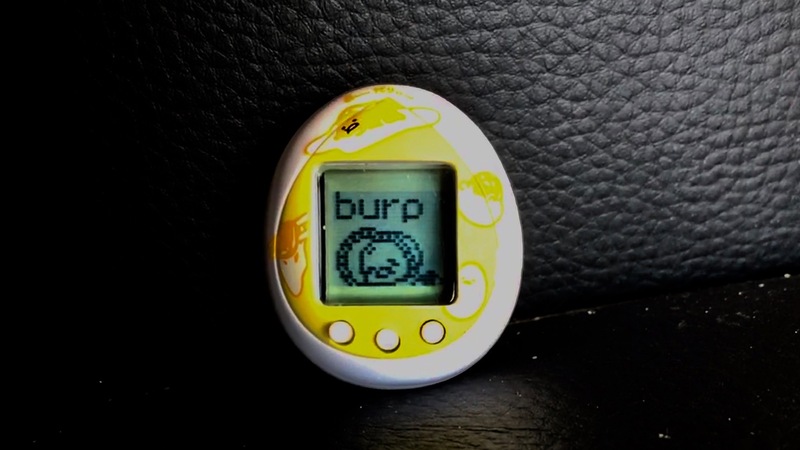 This is the only possible stage of life for the character, and they spend their time rocking back and forth in a shell and burping. After 24 hours, they mature into one of eight full-fledged Gudetamas. All of them look like various forms of the character Sanrio has marketed over the years, calling back to memorable designs. Each one also makes sure it is obvious that this character is an egg. The Gudetama Tamagotchi never shies away from reminding people that this character is food. This means death is always at Gudetama’s door. Throughout their life span, some unseen figure may attempt to eat them. If you neglect the character, they will become sulky and unhealthy, making them a more appealing target for a mysterious figure who realizes you are ignoring them. Should the alarm go off, you need to quickly tap a button to prevent the stranger’s chopsticks from grabbing Gudetama and taking them away to be eaten before their time. The “before their time” part is another important element of this toy, because eventually Gudetama will become a meal. It is the natural course of the character’s life. Even if you take good care of them, they will eventually turn into one of 20 different egg-based dishes. In fact, part of the fun of the Gudetama Tamagotchi is unlocking all of these different meals. Some only appear after getting other sorts of evolutionary paths and foods. The toy will even tells you when the menu has been expanded, which is nice! Celebrate Gudetama’s life by cooking it up! The Gudetama Tamagotchi leans into everything that makes this character so special. They are a cute, food-based mascot with designs remind you how adorably delicious they can be. I mean, they take naps using bacon as a blanket! Instead of avoiding the inevitable, the toy celebrates it. Sure, you are trying to save the character from being eaten too soon, but only so they can become the best dishes they could possibly be. You can find the Gudetama Tamagotchi at GameStop stores. You can get this Tamagotchi Nano alone, in one of two different designs, for $19.99. There is also a $24.99 variant that includes the toy and a protective shell to hold it.